An email address is required to deliver The Limbaugh eLetter. Please note, we cannot process your order without it. *Auto Renewal means your subscription will automatically renew each year at the current annual rate, unless you tell us to cancel. Terms and prices are subject to change; you will be notified in advance of any such changes. For questions about your subscription, please write: memberservice@rushlimbaugh.com. 1 year for US $29.99 includes your FREE issue (13 issues total) + 1 FREE Bonus Report: The Joy of Conservatism. 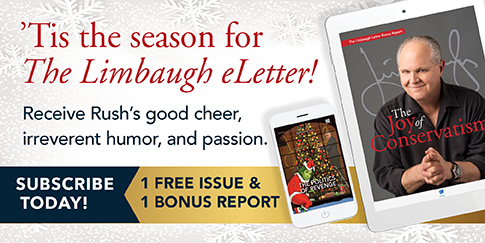 You will receive a confirmation email from us momentarily with a special link to the digital edition of The Limbaugh Letter, so you can instantly access your subscription. If you do not receive your confirmation email, please contact us at memberservice@rushlimbaugh.com. If you are using a spam filter on your email, please be sure to add limbaughletter@mailings1.gtxcel.com to your address book approved senders list. If you do not, you may miss important subscription information, like your link to The Limbaugh eLetter. For questions about your order or subscription, please call 1-888-681-7072 or write us at The Limbaugh eLetter, P.O. Box 420058, Palm Coast, FL 32142-0058.